(In theaters, October 2006) One of the best things about suspense cinema these days is how it’s finally going global: Syriana, The Constant Gardner, Lord Of War… and now this film, which follows the true story of a South African family man as he becomes a radical and starts fighting against his own government to bring down Apartheid. The movie works wonders in putting viewers in someone else’s shoes and making his situation understandable. By the time our once-shy protagonist straps on the AK-47 and decides to fight for what’s right, there isn’t much doubt in our minds that he’s doing the right thing. 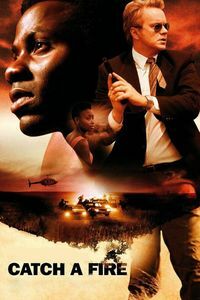 Amusingly enough, this 1980-era movie now feels more relevant than ever as twenty-first century western society seeks to differentiate between freedom fighter and terrorist: the line may be thinner than anyone expects, and Tim Robbins’ sympathetic portrait of an Apartheid enabler serves as a further reminder that what’s wrong is often perceived as being necessary. While a fairly restrained and intimate drama, Catch A Fire is not without its share of good moments and powerful sacrifices: Our protagonist eventually comes to lose everything that’s dear to him through a combination of being at the wrong place at the wrong moment, and being unable to accept submission. Well-done, well-told and well worth seeing.